RINA the certification, inspection, testing and engineering consulting multinational has been awarded the contract for PMC, Construction Supervision, Health & Safety and Quality Assurance of the new motorway bridge in Genoa, Italy, replacing the former bridge which collapsed on the 14 Aug in 2018. The project which is valued in excess of 200 €M will carry approximately 60,000 vehicles per day and when completed will give to Genoa a new important infrastructure. Project planning and deconstruction of the remaining parts of the bridge superstructure started on 15th December 2018 but today the major sections are being lowered to the valley floor as first important step during the full demolition of the bridge. “We are very conscious that the demolition and subsequent construction is taking place in the centre of Genoa and therefore we are placing great emphasis on reducing the impact on the Genovese population," said Roberto Carpaneto CEO at RINA Consulting and overall Project Director. He went on, “The new bridge is a high-profile project both for the city and for RINA and we are determined to ensure that the project progresses smoothly, on time and on budget, justifying the trust that Mayor and Commissioner, Marco Bucci, has paced in RINA when awarding this project". 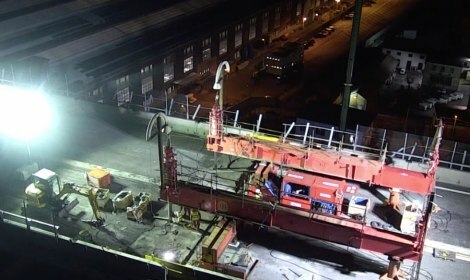 The new bridge which has been designed by Renzo Piano will be long 1,1km and over 45m high and it will be completed in the first part of 2020 followed by a 3-month test period. The new bridge is set to become a new landmark in this beautiful city and important Mediterranean port. RINA provides a wide range of services across the Energy, Marine, Certification, Transport & Infrastructure and Industry sectors. With a turnover in 2017 of 437 million Euros, about 3,700 employees and 170 offices in 65 countries worldwide, RINA is a member of key international organizations and an important contributor to the development of new legislative standards.